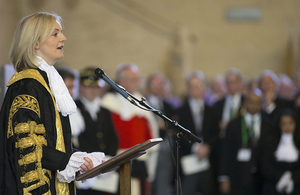 The Lord Chancellor, Liz Truss will today announce a radical new scheme designed to ensure that criminal sentencing is tougher and more effective. The move is rumoured to be the brainchild of Tory MP Philip Davies, who has previously called for measures to ensure that judicial leniency is stamped out. It will be implemented through an amendment to the Prisons & Courts Bill, which is currently under consideration in Parliament. "It should be clear to many that where a judge consistently allows offenders to avoid prison and those offenders go on to make others suffer as a result of their continuing crime spree, there should be accountability for the judge...And there should really be consequences for that judge as well. In particular, where they don't hand down custodial sentences which would be perfectly justifiable and possibly even expected, and particularly when the offender goes on to reoffend." Under the so-called Cell-based judicial Rehabilitation Administrative Penalty scheme, judges who deliver sentences which are later increased via the existing unduly lenient sentencing procedures, will be required to serve a sentence themselves equivalent to the difference between the original and the enhanced sentence - although for judges of good character this will be suspended in the first instance. Judges who fail repeatedly to adhere to the sentencing guidelines will also feel the impact upon retirement. Draft secondary legislation seen by this site states that "the daily cost of judicial accommodation and subsistence during periods of incentivisation will be deducted pound for pound from the capital value of the offender's judicial pension fund". "the rollout of digital justice will mean that judges will be able to continue carrying out their judicial functions whilst detained, their cells operating as pop up courts. It is important that all categories of prisoners are gainfully employed whilst incarcerated, in order that disruption can be minimised and rehabilitation maximised and this will both enhance judicial efficiency and assist with the rehabilitation of other offenders through the modelling of good behaviour and respect for the rule of law." Asked whether or not this scheme had negative implications for the independence of the judiciary or the justice system more widely, a spokesperson said that judges would be able to access the support of McKenzie friends to assist in the preparation of their defences, and with getting the videolink to work. "The Ministry remain committed to the utilisation of human resources, and are piloting a range of measures designed to maximise the efficiency of humanoid analogue forms of decision making. For example, drawing from studies showing that judges who have too much sleep tend to sentence more leniently*, we are experimenting with late night court opening as a way of nudging our judicial resource towards more appropriate sentencing practices." *see one such study here. The Criminal Bar Association has raised concerns that the pilot scheme is likely to create a sentencing postcode lottery. ...Yes, it is April 1st. And most of this is untrue (not all of it though!). Pics, Open Govt Licence from gov.uk website. This is a guest post by Rhys Taylor. Rhys is a barrister and arbitrator at 30 Park Place, Cardiff and 36 Bedford Row, London. Rhys specialises in financial remedy and family property disputes. He lectures for the Judicial College on the subject of pensions on divorce. The views expressed here are entirely personal. Rhys tweets as @rhystaylor32. Financial proceedings following divorce can often be complicated and, if you can afford it, I strongly commend the instruction of a solicitor who can assist you through the maze. This short note is written for those who would like to instruct a solicitor but cannot afford to do so and find themselves bewildered by the issue of pensions and how that fits into a divorce settlement. You are at an important crossroad in your life. You are about to make some very big decisions which may have lasting consequences. My headline is : take the issue of pension provision seriously. So often, retirement can seem a distant prospect and more immediate needs, particularly for housing, dominate. Time has a nasty way of creeping up, however, and retirement may be nearer than you think. I am not qualified to give financial advice, for which you must seek out an Independent Financial Adviser or a Chartered Financial Planner. I do know that many of them would urge you not to lightly trade away your possible rights to pension capital in exchange for more capital now, or worse still, for a quiet life. Clearly you will need a house to live in, but in some circumstances it is possible (and your guardian angel might counsel you to do so) to bite the bullet and downsize now, so that you can have a basket of apples and pears i.e. some liquid capital with which you can buy housing (perhaps at a lower standard than your former matrimonial home) and some pension capital which will provide for your old age. I know that this will not always possible and immediate needs may simply demand a trade between apples and pears in order to keep a roof over your head, but do not do this too lightly and without having thought about your future and how you will afford to live in your old age. The state pension changed in April 2016. The changes are complex, but it remains miserly and the so called “Single Tier” pension is anything but that and is subject to all kinds of complicated adjustments, dependent upon how many years you have contributed. Worse still, the ability of some spouses to substitute their partner’s National Insurance contributions has been removed. You can find a more detailed potted summary of the complex state pension changes and how they impact upon divorce at Appendix B of a paper I have written for lawyers, which is to be found on the Jordans website. You must insist on proper disclosure of all pensions. Some people are reluctant to disclose. If they are difficult, you have a right to make an application to court for financial remedy proceedings and the court will require proper pension disclosure in a document called Form E.
Prior to making an application to court you will usually have to attend upon a mediator who is qualified to conduct a Mediation Information and Assessment Meeting (or “MIAM” for short.) In many instances mediation is a very wise road to go down, but even in mediation you must insist upon proper disclosure first and if you are at all dissatisfied the court will insist on that disclosure on your behalf. How do I value a pension? Pension disclosure normally comes in the form of a Cash Equivalent (also known as a Cash Equivalent Transfer Value, CETV, CEV or just CE). This is a figure which a pension scheme actuary will place on the pension as his or her assessment of what the scheme would need to be paid in order to agree to transfer the pension elsewhere. But, be warned, the Cash Equivalent does not always tell a true story. This is particularly the case for a final salary or career average salary pensions which have a guaranteed benefit at the end of the day. The Cash Equivalent will be an illusory figure if the benefits are guaranteed and no transfer to another pension scheme actually take places. The value will be in the pension itself, and the benefits it will bestow in due course, not in the potentially misleading Cash Equivalent figure. An expert will often be required to provide an accurate assessment of the true value of the pension. It is well known that different scheme actuaries take difficult factors into account in arriving at Cash Equivalent and in big schemes the costs of investing and administering the scheme are not always factored into the figure. By contrast, a defined contribution or personal pension will usually fully factor costs of investing and administering into account and the Cash Equivalent will often be a more realistic assessment guide to the true worth of the pension. So, the basic problem is that a defined benefit pension which has a Cash Equivalent of, say, £100,000 may provide a very different income on retirement to the defined contribution pension also said to be worth £100,000. There is no crafty small print which makes a defined contribution pension behave like a defined benefit/final salary pension (e.g. a defined contribution pension which has a guaranteed annuity rate upon retirement). In other circumstances the investment of a few hundred pounds for advice from an Independent Financial Adviser may well be strongly advisable. Where is the best online guidance? The Family Justice Council has recently published a paper, “Sorting out Finances on Divorce” to assist litigants in person navigate divorce settlements without a lawyer. This is essential reading. At pages 42 to 47 there is an admirably clear exposition of how pensions should be treated upon divorce. This is a very important document which judges will take notice of. If you are trying to settle a case without going to court then treat this as your trusty guide on how a court may approach your case. You are not bound to agree a settlement in exactly the same terms as a court would determine it, but it is often helpful to negotiate “in the shadow of the law”, i.e. with a rough idea of the range of possible outcomes and approaches a court would have in mind. The Family Justice Council also recommends that you seek advice from an Independent Financial Adviser. How do I find the right pension expert to help me? But who do you turn to? There is a bewildering array of “experts” out there and if you can scrimp together the professional fees to see an Independent Financial Adviser you want to know that the money is well spent. I cannot advise you who to go and see but can offer the following thoughts. Advising on pensions on divorce is a highly specialised area and many would agree that there are only a small handful of truly expert Independent Financial Advisers out there (and here I am also including Chartered Financial Planners, who are Independent Financial Advisers who have passed further stringent professional examinations). In finding a true expert you may have to travel to see them or conduct your business over the phone with them. I cannot provide a definitive list of experts who I regard as suitable, but make this (personal) suggestion. I was involved in a project which had discussions with many Independent Financial Advisers and actuaries. It is called Apples or Pears: Pension Offsetting on divorce. There is a list of experts who were involved within the paper which may assist your search. I was also assisted by further experts in another paper called "Another Witches' Brew" (so called because pensions can get very complicated). There will be other true experts out there who were not involved in either paper, but this is a suggested start in your search for help. You will want to get “triage” advice in the first instance and a good pension expert will then be able to advise whether you will also need the assistance of an actuary. An actuarial report may cost up to £1,500 + VAT but, if required, may be a very prudent investment. A court would require this cost to be shared equally between both parties. Disclaimer As with all posts on this blog, this post is no substitute for legal advice and should not be relied upon as such. No responsibility is accepted for any action taken or refrained from as a result of reading this blog.